Signal From Space. False Alarm? An array of radio telescopes. That is perhaps the ultimate question in science. NASA's Kepler telescope is capable of monitoring the brightness of more than 100,000 stars simultaneously. It attempts to detect miniscule reductions in their light. That is often caused by a planet passing in front of the star. Further analysis gives some idea of the size and orbit of the planet. In the future, it might be possible to build a massive telescope to detect oxygen, water, carbon dioxide, and perhaps industrial pollutants from these planets. Detecting certain types of pollutants would prove the existence of intelligent life there. On one hand, it seems quite possible that intelligent life exists on other planets that are circling around different stars elsewhere in the universe. One indication might the relatively brief interval it took, after the Earth coalesced circa 4.5 billion years ago, until the most primitive forms of life developed here. Until 2016, the oldest forms of life on Earth were found in stromatolites -- "macroscopically layered structures produced by microbial communities" 2 located in the Dresser Formation of the Pilbara Craton, Australia. They were dated to 3,480 billion years BP (Before the Present). However, a 2006-AUG article in the journal Nature announced a similar discovery made in the Isua Supracrustal Belt (ISB) in southwest Greenland. The latter stromatolites have been dated from 3,800 to 3,700 million years BP. 3 That is, they were alive "only" about 760 million years after the Earth itself coalesced. It is believed that much more primitive forms of life existed on earth even earlier, but their remains have not been detected to date. Thus, the first forms of primitive life on Earth seems to have developed relatively quickly after the Earth itself formed. There is a distinct possibility that life could be established and evolve elsewhere in the universe as it was on Earth, if conditions were right on another planet or moon in a different solar system. Scientists estimate that at least 100 billion galaxies, 4 and 70 billion trillion (7 x 10 22) stars exist in the observable universe! That is equivalent to almost ten trillion stars for every human on Earth! If one includes the total universe, beyond what is observable from Earth, the number would be much larger. "...nearly every [nearby] star hosts at least one alien planet. ..."
There is no obvious reason why stars in other parts of the universe beyond the Milky Way -- our galaxy -- would not have similar planetary systems. If conditions were similar on other planets circling around other stars, then one might expect life to form there as well during many planet's first billion years. This would probably be in the form of single celled living organisms. Wherever life was established, most scientists would expect that the process of natural selection would probably cause millions of species of life to evolve over the following billions of years. This makes the development of intelligent life possible on other planets. By 2015-JUL, NASA's Kepler Space Telescope had confirmed the discovery of 1,030 exoplanets -- planets rotating around other stars. More exoplanets continue to be found. Of these, many are in the habital zone of their stars. 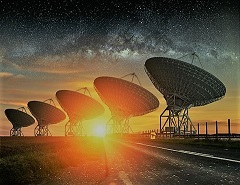 On the other hand, scientists in various SETI (Search for Extra-Terrestrial Intelligence) programs have been scanning the heavens, attempting to detect radio signals from other planets. They have been unsuccessful to date. If a signal could be detected, then this would almost certainly indicate the existence of another intelligent species of life elsewhere in the universe. Scientists in Russia reported detecting a strong radio signal using their RATAN-600 radio telescope in Zelenchukskaya, at the northern foot of the Caucasus Mountains. 9 It was at a wavelength of 2.7 cm which is equivalent to a frequency of 11 Gigahertz. This is a frequency similar to those used extensively by TV satellites rotating around Earth. 10 They tentatively identified the location as coming from the solar system surrounding the star HD 164595. It is located about 95 light years from our solar system, and was already known to have at least one planet that is roughly the size of Neptune in our solar system. It's sun is similar to our strength in size and brightness, but is a few billion years older than our sun. The scientists who discovered the signal now doubt that the signal was generated by extra terrestrial intelligent life. Still, it raised enormous interest when the Russians finally announced their findings to the world over a year later. Cosmology: Pagan, Biblical, & Modern Beliefs About the Earth, Moon, Other Planets and Sun. Beliefs about the origins & development of living species, the Earth, & the rest of the universe. Seth Borenstein, "Greenland finding could be oldest fossil on Earth," Toronto Star, 2016-SEP-01. "How do we know how many galaxies are in our universe?," Physics.org, undated, at: http://www.physics.org/"